Stone is over 500 pounds. Devonian I think. Hoping to I.D. specifics. You are right this area is Devonian in age. Gilboa is know for its petrified trees and plants but your specimen appears to be sea creatures and lots of them. While I can't name everything pictured here I do see partial fossils of what looks like brachiopods, clams, and possibly trilobites. 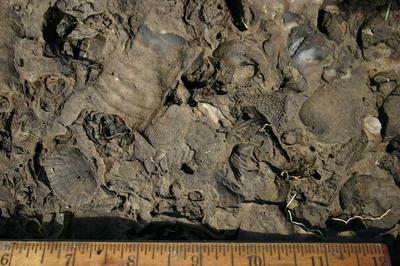 The largest feature in the upper left looks like part of a sea scorpion or eurypterid.